Commecerial Discription:Barrel-aged in Woodford Reserve bottles. Brooklyn Black Ops does not exist. 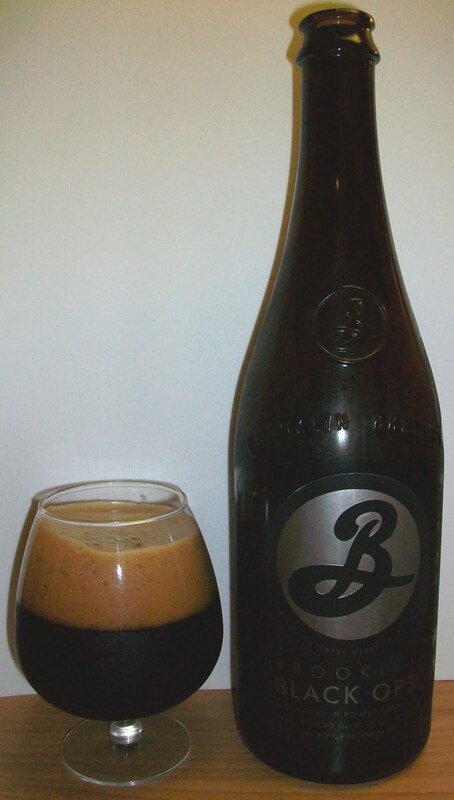 However, if it did exist, it would be a robust stout concocted by the Brooklyn brewing team under cover of secrecy and hidden from everyone else at the brewery. Supposedly, "Black Ops" was aged for four months in bourbon barrels, bottled flat, and re-fermented with Champagne yeast, creating big chocolate and coffee flavors with a rich underpinning of vanilla-like oak notes. They say there are only 1000 cases. We have no idea what they’re talking about. Background:I’m a sucker for anything Brooklyn brews. Well, that didn’t come out right. I’m a huge fan of this brewery. Yeah that’s better. I heard about this when shopping in a small beer store and the owner was telling me how good it was and that he can’t get any more of it. About two weeks later I saw it at another store and picked it up without even looking at the price. 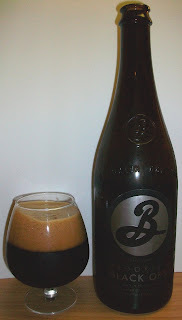 Like I said I’m a huge fan of Brooklyn well actually Garret Oliver their brew master. Ok so enough already lets see what this Black Ops thing is all about. 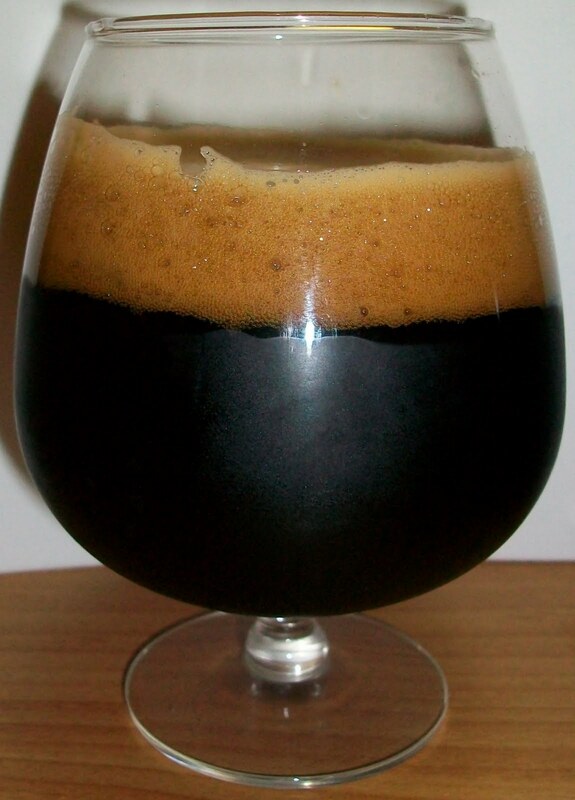 Review:The beer pours a dark brown stout dark, completely opaque with no light getting though the glass and a dark tan to chocolate milk colored rich head. Wow, this nose is amazing. There is so much going on this nose I’m going to have a hard time describing it. There are extremely rich roasted malts, exquisite dark fruit notes along with toasted nuttiness and a sweetness that I assume is the alcohol. Along with some more typical notes of coffee and chocolate there are also a ton of other notes coming out of this beer that I just can’t explain. We are starting this one at around 52 degrees. It has been out of the 40 degree beer fridge for a little while now. Wow, this is a very robust and complex stout. Sweet roasted malt up front then a nice creamy middle of the sip. There is also a slight but building malt bitterness in mid-sip. The back-end is where you senses kink in and tell you that this is no lightweight. Although it is surprisingly smooth and easy to swallow you know this is a big beer. There is still some effervescence during the swallow that masks some of the flavors but they all hit you on the finish. The finish is exquisite. Rich roasted malts, caramel, toasted nuts, dark fruits, coffee and chocolate notes and some yeasty notes all with the most gracious creamy coating throughout your mouth. The final after taste is that classic lingering stout maltiness with an earthiness and alcohol. There is also the most comforting warming effect from this beer. It’s one of those feelings that make you just want to sink into your seat and enjoy the long slow ride. There will be no, rushing of this beer. I want to take my good old time and savor every sip. This is one fantastic beer. This makes their black chocolate stout seem like a light weight and I thought that was fantastic. This is a very unique Imperial Stout. There are subtle flavors here that I can’t even begin to describe. I don’t think I’ve had an imperial stout with this much complexity. What a great beer. What an amazing beer. One unique thing I’m picking up now at that it has warmed and opened up is a definite hop presence. I really did not notice the hops earlier. The roasted malts are perfect. So many times there is a harsh bitterness from the roasted malts but I’m not really getting that here. There was a touch of that early on at mid-sip but I’m not getting any malt bitterness now. This is really getting smoother as it warms. This is extremely frustrating that I cannot articulate what I’m tasting in this beer. This is just exquisite. And it’s getting better and better as it warms. The end of this first snifter is now at 65 degrees and just fantastic. There is not just lacing, there is a beer coating left around the bottom and sides of the snifter. This is one rich beer. This second glass I’m going to warm like I have with some other rich beers. And I don’t mean let it warm to room temperature; I’m going to use the snifter in the palm of my hand to warm this up like you would a fine cognac. We will start at 61 degrees. Oh my, this is getting good. I’m somewhat surprised at the amount of combination still. Even the nose is sweeter with more bourbon flavors from the alcohol escaping at these warmer temperatures. This is just beyond belief. I’m just sinking in my seat. This is one of the most comforting experiences. This beer at 79 degrees has the most sweet roasted malt flavor. Also the chocolate and vanilla oak favors are outstanding. I still have a good amount left in the snifter. Let’s see how high I can go with this. Outstanding, this is just amazing. It is incredibly smooth at this extreme temperature. It is astonishing that this beer has just gotten smoother and it warms, even to this extreme of 89 degrees. This is just one phenomenal beer. I realize that I’ve been saying that but this is just beyond belief. How can you warm a beer to 89 degrees and it not pick up anything unpleasant? But not just that it’s actually has gotten better, richer and smoother than it was chilled. I still have some left in the bottle lets go back to that and compare it to the warmed beer. Ok, we are backed to a somewhat chilled 67 degrees. That’s interesting by comparison there is a little more harshness or malt bitterness with this that I did not notice warm. And while this was chilled and gradually warming I did not notice this malt bitterness. This may also be a slight hop bitterness? Man, I don’t know how I’m going to end his review. My limited vocabulary has run out of words a long time ago. This is another great masterpiece from Brooklyn. Garret Oliver is simply the master of his trade. Words just cannot describe this beer, well my words can’t. This is hands down an A+. I still don’t know why I haven’t come up with an O for outstanding but I’m stuck with an A+ still the highest rating I can give a beer. This is a very costly beer but I really do think it is worth it. Actually I’m going to look for a few more to cellar for a while. This beer has my highest recommendation to anyone that likes an imperial stout. Please do yourself a favor and treat yourself to this amazing beer. I know that I can't get anything from Brooklyn Brewery out here, so PLEEEEASE save me a sip for if I ever get back east!!!! Sure thing Ken. I haven't picked up any more, hopefully they are still available.